Our quaint beach bungalows are inches from the ocean, with no roads between the rental and the beach! Right next to the bungalow there is a shared patio to enjoy with a barbecue, fire ring, large grass area, and sandbox for the kids, all with the beach as your backdrop! Each unit has its own kitchenette with a refrigerator and oven/stove. Kitchen utensils, towels, & linens are all provided. Wall unit AC is available to help you cool off on those hot sunny days. These units are perfect for romantic getaways, a gathering with friends, or for a small family. And you'll love the location of Oceanside! The vast ocean views and sand, year-round beautiful climate and adorable downtown attractions (ie: Oceanside Museum of Art) make it the perfect setting for a beach getaway. After falling asleep to the sound of rolling waves, you'll awake refreshed and relaxed. Spend your days at the beach, or explore the other coastal attractions Oceanside has to offer. Check out the California Surf Museum, or take a stroll down the Oceanside pier at sunset. You could even take a sailboat out on the harbor! You will not find a better deal on a beachfront vacation rental! *The San Diego Airport is roughly an hour drive from our Oceanside properties. All homes in Oceanside, CA sit behind a rock barrier protecting the homes from storm surges. The amount of sand beyond the rock barrier varies quickly with storms and tides and may have more or less sand than what is shown in the photos. Why stay with Beachfront Only? For the past 15 years we've specialized in luxury beachfront properties. We take pride in our superior customer service and our experienced staff is here to ensure that you and your guests have the best vacation. There is a 24 hour helpline for questions and concerns you may have during your stay. Beachfront Only is among the few city registered and permitted vacation home rentals companies. We have been recognized on Tripadvisor, Flipkey and Escapia for our excellent service. What are you waiting for? Starting booking with us today! Rates listed are only estimates on the lowest available rate, some nights are subject to additional fees when booking less than 5 consecutive nights. Additional fees apply, see detailed quote for complete pricing. Awesome place to stay, it was very cozy and clean. Beachfront Only is a great company to rent from. I chose this property specifically because it was on the beach which was exactly what I wanted. I was only spending a couple of nights there and wanted as much time with the ocean as I could get. As anyone can see from the pictures, the views are beautiful and the walk to get a closer view was not far. We did have to drive to get access to actually walk on the beach which I hadn't expected, but it wasn't far. There are tables closer to the water with a nice view which we enjoyed. Parking is a difficult thing, particularly if you have mobility issues. It is on a first come basis and there is not a parking spot for every room. We managed to find street parking right beside our room which worked out for us. I'm not sure what it would be like in the summer. The inside was pretty, although because of the coolness of the weather we did spend the evenings inside watching tv. The couch, sadly, was terribly uncomfortable. Thankfully, the bed was very comfortable which is more important. We found a couple of nice places to have dinner in the area and there was a Starbucks to get our morning coffee at. There were probably other coffee shops but I didn't see them. In any case, despite the couch, I enjoyed my stay and would recommend this little place if you want to spend some time by the ocean. We were very happy with our entire rental experience! From the Hospitality App to check out and everything in-between. The room was cute and the bed was incredibly comfortable. The shower is small, but totally efficient. The property is adorable and in walking distance of the pier, restaurants, and a swim-able beach. Slept with the windows open and enjoyed the sound of the ocean hitting the boulders all night! There is also a train nearby, but we were used to it on the second night. Overall, great experience! I traveled here with my 2 very young little boys and we had a great time. The layout is wonderful for a small family such as ours.. the boys really enjoyed the deck and I liked that I could open both doors and let them play. Our 1 BR was a good beachfront getaway . . . cozy and very adequate for our purposes. It is cute little place, how ever the A/C only keeps the kitchen/living are cool, the bedroom does not have a/c an it was a little warm. The fans did help. We asked for bath towels from the house keeping ladies and they never came back with our towels. So we used our own beach towels as bath towels. It was a high tide so we still had to drive to find a beach spot to enjoy the beach. Last minute booking. They made process simple and convenient. Checkin & check out was easy. I like the little cottages. Loved our private patio. Highlight was the common area. None of the other rentals (even the fancier units) in the area had this feature! Only lack for us was no air conditioning. 2nd time staying at this location, first in this unit. Love the little porch. Couple of issues: please place a shim or leveler under the range, difficult to cook as is and it is really a pretty simple fix. Some shelving for groceries would be great; I realize space is limited but pretty sure you have room for a couple shelves. A cutting board would have been nice. But overall I love the place. 1. Management was very professional. 2. We loved the porch to look out over the rocks and have coffee. 3. The kitchen and all amenities were very well stocked. 4. The location - gate opened to a very steep walkway. Seniors like ourselves will have a difficult time navigating it. 5. We expected to be able to access the beach right there but had to go down to Buccaneer Bay by car. 6. The Flying Pig was a great restaurant. 7. Rooms were very clean. 8. All of the units outside need refurbishing. Scraping/painting so it does not look so shabby. NEXT TRIP WE WILL BRING OUR DOG. SHE WILL LOVE IT. This was the perfect location, so close to the beach and ocean! The booking process was seamless with everything I needed received far in advance. The unit was cozy, comfortable and well stocked. Every morning we could take a walk down the beach to the pier. I had initial concerns about adequate parking, but it was a non-issue. This is a place I would definitely visit again and I have already referred a couple of coworkers to Beachfront Only! This was a cool place to stay, and very close to the water. But there were a few hiccups throughout our reservation/stay. While shopping around for places to stay in the area, one of the BeachFront only representatives told us we could rent the place at a 5% discount. However, when we went to finalize our reservation a few day later, they would not give us the discount. This was very misleading. They did end up throwing in "late checkout" because of our complaint. However there apparently is a separate code for late checkout, which they did not inform us about. The morning we were packing up to leave, we were locked out of the unit because of this. We eventually got a hold of them, and they gave us the new code. TV didn't work. No soap in the bathroom. Very over priced. I would've been better off in a nice hotel for half the price. Almost $1200 for 2 nights. We were satisfied with our experience. The rental had the most uncomfortable couch we have ever sat on and one of the most comfortable beds. So it even out. We had a wonderful time! The beach house was in a perfect location near the ocean, and was very clean with all the amenities we would need. He couple concerns we had regarding guests smoking on the property and some dirt removal going on the morning after we arrived was taken care of to our Satisfaction by the property management company. The Landscaping outside of the Bungalow seem to be a work-in-progress looking forward to seeing it finished should we be able to stay there again. The entry gate right outside our door step saw way too much activity between midnight and 5 a.m. to the Four Knights that we stayed. Not sure if they were guests or not but they used the common area and More in and out of that gate several times. Would be nice if there would be some type of security gate on the property. The property we stayed in was very clean, very comfortable, well supplied and we had a very relaxing time. We had a great time at this rental, small but very cozy and was everything we needed as a couple to have a nice romantic getaway. Room was very clean, included everything in case you wanted to cook, which we did not. Great location close to everything and the patio is AWESOME!!! Great location and beautiful views. Very nice romantic getaway. Great little place by the beach! Our little beach side bungalow was perfect for our visit to Oceanside. The ocean was right out our door and the unit we had included a wonderful deck to sit on and watch the waves. It had everything you need for a 5 day stay....fully appointed kitchenette with gas stove,microwave, blender,toaster coffee maker (although they did not include filters...we left the ones we bought behind for future guests) It was very cozy. The shower is not made for big guys like me, but I made due. The bed was comfy and they had everything you needed as far as towels. The common area was awesome with tables and chairs as well as a gas BBQ and the awesome fire pit! It was a great place to hang out and listen to the waves and meet your new neighbors. Sadly we noticed a sign that said the "common area" was sold to develop a 3 story condo unit, so we will not be back again to this location since the appeal was the awesome fire pit etc. I will however rent again with . They were easy to book with and even when our unit had an A/C problem, they via only email on a Sunday had someone fix it within the first few hours after we arrived. In fact we checked in,noticed it was not working...E-mailed them... while we went out to get was fixed by the time we got back! Rental was exactly as described. Would be nice to have a dresser or some place to put your belongings... there was zero storage space for luggage or bathroom supplies, but it was peaceful and the location was great. My wife and I really enjoyed our stay at the Oceanside Beachfront Cottage. 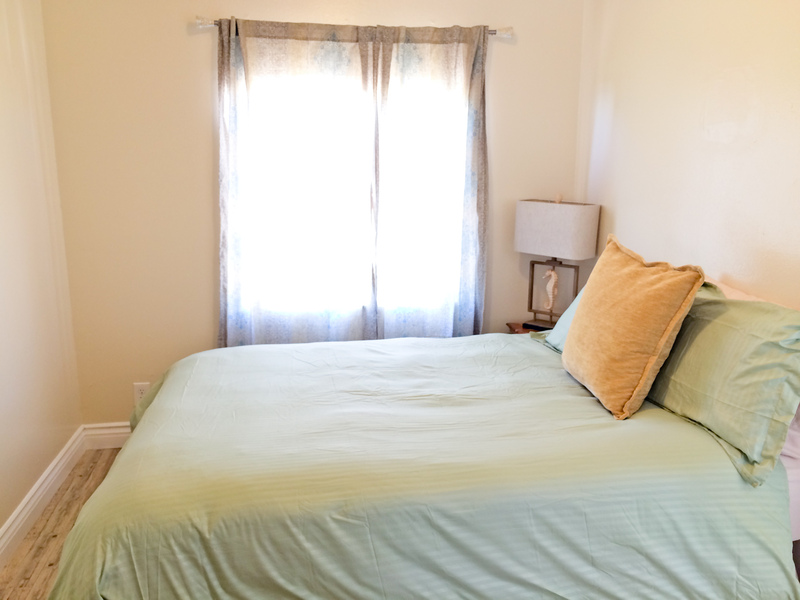 The cottage is not necessarily luxurious, but is very clean, updated interior, very peaceful location along the Ocean for a very affordable price. We would definitely stay again if we are down this way for an extended stay. Oceanside is a nice town; a nice coffee shop/bar a couple blocks away; a nice breakfast diner just a little beyond the coffee shop; and a tea shop in between; all easily walkable. Nice restaurants along the Coastal Highway. We took a two hour sailing excursion at the Oceanside Marina, which is a short drive. The location is close to Carlsbad, which is a cool little coastal town. This was a very family, and pet friendly location as well (though we didn't bring pets, or any children/grandchildren; others did, and it was nice to see family's having enjoyment). Pros: The unit is adorable and the bed was super comfy. The common area is amazing great place to chill and relax watching the sunset. The location was perfect. Located at the end of The Strand so not a lot of foot traffic. Cons: Couch is so uncomfortable should replace it. This place was beautiful and a perfect atmosphere for the family! Everything was as described in the website for this particular apt...they were tearing up the road that week, so a bit noisy but tolerable. Great to walk to the pier or into town daily - about a mile, and the beach was so inviting. One day of rain but it was refreshing. We had an amazing time. The place was wonderful. The outside area is a nice bonus. Street noise is quite evident, as compared to the other units, but again, the sitting are is very nice. 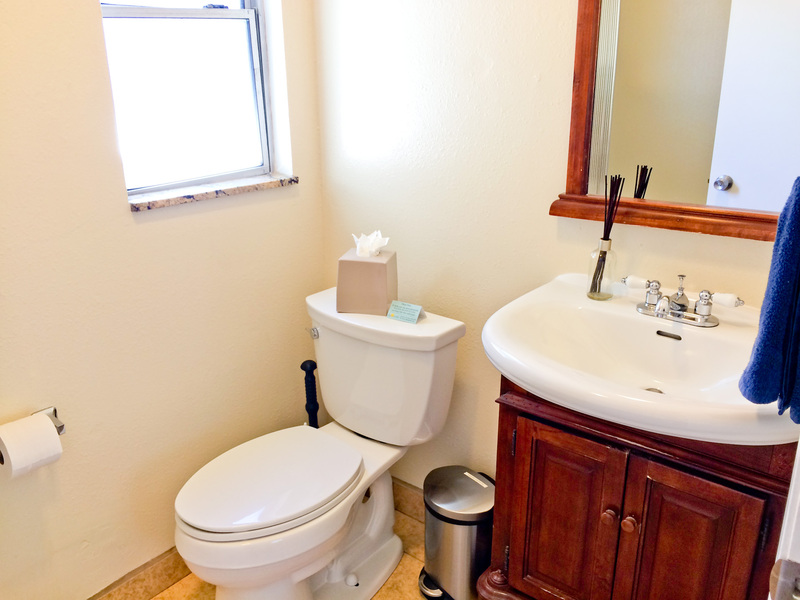 The bathroom needs a shelf or cabinet to place toiletries. The complex was well kept and the inside had obviously been redone. There were small things that needed a little improvement but basically it was very well done - but very small. Loved the location and the shared patio on the ocean. Quiet and we had a deck as well which was wonderful. No air conditioning but the open doors and fan took care of that. The rental was very clean and the common area large with plenty of seating. Overall a great experience. My only feeling is that given the size of the rental the cleaning deposit is too high. We were also awakened at 330 am by someone going thru the trash bins which were located near our rental. A few steps from the beach! Was pleasantly surprised just how close to the beach it was. Cottage was clean and neat. Recommend adding a potato masher to utensil drawer. Only complaint was that we got locked out on last day, when we took out the dogs for a, walk. Was stressful, since we had paid for a later check-out. We were thrilled to find a way to stay 'on the beach' inside our budget. Unit #5 is clean and . Parking was a plus, being just steps from the sand was delightful, and everything was very clean. Spent 3 glorious days here , the only thing I would add to this cozy bungalow would be a small quiet air-condition in the bedroom , but other than a perfect getaway ! We have stayed at 835 S. Pacific several times and hope to return every year. We love whale and dolfin watching, walking to Ruby's at the end of the pier, and attending the street fair and art walk. Add in perfect weather and it makes for a memorable stay. We've stayed here a couple of times. Not a bad deal for an inexpensive getaway but keep your expectations in check. Nothing fancy. Good prices only few months of the year but crazy expensive other times. overall very happy with the experience. The deck on this cute beach bungalow is amazing. It creates an extra room with a priceless view. The grass area in front is perfect for families with toddlers. It's safe and fun. I highly recommend this unit. The rental experience was easy, fast and convenient. The location was beautiful and the home was perfect. Only wish we were provided a Extra towels and sheets like initially requested. The bungalow was a very cute cozy place. It was in a great location to where you can sit out on the little deck and look at the ocean. There were a few issues, but I contacted Nanci and she did what was in her power to take care of the issues. Some things are out of her control, but she was really great. A few issues were the fact that we didn't know they were doing construction on the building right outside our door. Weren't really happy about being woke up at 6:30 in the morning with all the noise from that. Nanci did respond to our issue with that. Another issue was parking is not really great right now, simply because all the construction workers take the parking spaces. Again, Nanci handled that the best she could. Only other thing I would have to say is that the shower is a bit small in the bathroom, a little hard when your husband is 6'4", and it is a little hard to turn around or move in the shower. The only other thing I would suggest is that maybe you put a little more comfortable couch in the living room. Internet could be a little better, it was very slow and not very reliable. We were a little disappointed when we saw there was no sandy beach between the big rocks and the ocean. We went to the Buccaneer Park which was less than a mile with clean restrooms, snack bar and free parking. Very much enjoyed it. The condo was perfect. Very clean. Wonderful view. Love the sound of the waves crashing on the rocks at night! We book this rental for our honeymoon and it was perfect. We absolutely loved it! We weren't looking for anything big. We wanted something close to the ocean and this rental delivered. We had one issue where our cakre and internet went out but it was fixed immediately after we called. We would definitely rent here again. Very nice except couch very uncomfortable and living area needs a lamp. No instructions for DVD Player and it wouldn"t work. We called about it but never got a call back.A family had the front Cabin and several others and was very territorial to us other guests!! We enjoyed our rides to San Luis Rey mission, the train to San Diego x 3 ,with and without our bikes.Our location and rooms were perfect. Loved the guest patio area. Convenient to the pier and to other public beaches. Would definitely stay here again if/and when we get back to CA. Loved that the beach rental was pet friendly; only suggestion would be to completely enclose the little patio somehow so that it's ok to leave the door open for fresh air and the patio is enclosed for the pooch. The cottage was small but cozy, it had everything we needed. We will definitely stay again in the future! A Fantastic Place for a Get Away! This little beach place is amazing. It's super clean, very comfortable, in a FANTASTIC location - truly beautiful. We went for our anniversary in January and enjoyed walking around to different restaurants and down to the pier. Parking was always easy and we would definitely come again. The view was perfect, the bungalow was just what we were looking for and the price was just right...look no further, these units are in a prime location, clean and cozy. Can't wait to come back and visit again! We stayed in #5. It was clean, quaint & comfortable. Perfect for a couple. We felt safe & the common area was nice to sit & relax by the fire pit & enjoy the sound of the surf. We were there for the Ironman & the location was perfect; located on the run course & close to the finish line at the pier. We walked to The Flying Pig for dinner & rode our bikes back & forth to the Harbor. Try The Cup for coffee in the am. We will definitely stay here again. My husband and I were very happy with our stay. Inside and outside were very clean and tidy. We didn't cook at all but used the kitchen for snacks and lunch. The bed was very comfortable. The shower was a bit small, but was just fine. We loved being able to open up the windows to hear the ocean. The deck was especially nice to sit and drink coffee however, the chairs provided must be for very small people! I used my own camp chair and it worked out well. The one suggestion I would HIGHLY recommend, is to put a bigger better couch in the living room. The house slants a bit forward from that wall and the rather OLD couch pitches you forward like your falling out. There is plenty of room to put a longer better sofa in that space. My back was a wreck trying to watch a bit of tv before bedtime. Thank you Beach Only Rentals for a wonderful place to spend our vacation. I would love to stay again next time we visit California. Our bungalow was beautifully decorated. It was very clean and well stocked. Our rental was on the right side, so parking was a not as easy as those on the left. Also, no beach access, really. The view is beautiful. We enjoyed our stay very much! We stayed in 835#5 we enjoyed it very much it was small but served all of our needs just fine, we not only would recomend it to our friends and family we are planning a trip next year in the big house at 825. The wedding party stayed there and a lot of our time was spent there, Just wonderful. Thank you beachfrontonly staff. We haven't been to San Diego area in over 10 years. So when I started researching places to stay I came across the Beach Front properties website. It looked like the perrfect place for us to stay. We rented the small property at 835 S. Pacific #5. It was perfect and much nicer than staying in a hotel. The location was great for traveling all the near by attractions. The staff was very friendly and accomodating when we requested a slightly earlier check in. I will definitely be returning to stay in the oceanside area and have already recommended to friends who have made reservations as well. Thank you Beach front Properties. Everything was perfect. On our check-out day, we were finishing up at about 10:10. I was aware check-out was at 10:00. Someone came by to clean the unit, but I was in the process of vacuuming - my last task after cleaning the kitchen, washing dishes, etc. My mistake was the room should have been ready for the person who stopped by. We invited her in and she said she'd start with washing the sheets,towels, etc. At 10:20, a female came to the front door, which was open, and identified herself as the manager. The following conversation I had with her is the reason, Ihate to say, I wouldn't rent from Beach Only Rentals again. After identifying herself as the manage, she asked if anyone had been by to clean our unit. I said yes, and added she was in the washing machine area washing linens. She said, "We're you aware check-out time was at 10:00?" I said yes, but indicated I knew the room wasn't rented due to a call I received the night before indicating we could rent the unit for three more nights if we desired. At this time, we were basically out of the room. Our belonging were outside on the sidewalk while my son and I were finalizing the cleaning and looking for odds and ends that were still in the room. The manager then began to scold me about not being out of the room by 10:00, explaining how tight of a schedule the person who prepares rooms is on. I apologized, saying I was aware of the check out time. She then asked, in a very rude, condescending tone, so when are you going to be out of here? I said, "5 minutes because we will stop cleaning." We were out in less than five minutes. Cozy Bungalow on the Beach! These are affordable cozy little bungalows right on the beach. They had everything I needed for a great stay in Oceanside. Sitting around the firepit in the evening is always nice. You get to visit with the other guests and maybe roast a marshmellow or two. I look forward to staying there next year. and fenced yard for dogs, but unit #5 was otherwise perfect for our needs. Although small, everything you need is there. It is fixed up cute inside with all the comforts. We enjoyed the fire pit every evening and met many nice people from all over. We will return next year and hopefully there will be shelves installed in the bathroom. Watching dolfins, sea birds, tall ships, and people were fantastic. Great place to stay for this event! next to the beach and right on the run course! The cottage was just what my girlfriend and I were looking for. The amenities were perfect and we didn't have any problems with the condo. Beachfront Only has a wonderful administrative & operations team who do everything they can to accommodate their guests' needs, including welcoming pets. We had wonderful days walking our dog up and down the strand, taking in sunsets over the waves and the Oceanside Pier. We will be returning again at the end of year for our 3rd stay. We highly recommend Beachfront Only. Great! Only thing that was amiss was the salt and pepper didnt work, Oh well no big deal! We love it and would go back again. I want to get the front bungalow next time. We are sorry you had an issue with parking! We try to reserve all of the spaces infront of the bungalows, but sometimes they get taken. Usually, there are plenty of street spots as well, but the holiday weekend must have had an impact. ~ The Team at Beachfront Only. My stay was very enjoyable.The rental was spotlessly clean and comfortable. the location was ideal . The management staff were very helpful. I wold like to return again. We had trouble with the refrigerator. 1st one didn't work and they promptly replaced it and the second didn't keep food cold either!! Our grand kids were with us and it was hard for them to play in the common area - two couples we saw never picked up after there dogs - I had to do it. Maybe one more sign and bags would help them get the message. I understand this wasn't normal, but the "Flies" were awful while we were there. No one was using the outside eating area and tables. Suggest spaying and emptying the garbage cans more often. That said, the location, cleanliness, and furnishings in the unit were great. Very nice property for the low budget traveler. We decided that above everything, we wanted to be a short walk from the beach on our vacation. We pulled in, found our unit, then went outside to see how close it was--around the corner, literally. We had a toddler with us, so the location made a huge difference in how easy it was to get to and back from the beach. We had so much fun. The property isn't necessarily luxurious, if that's what you're going for. But it's comfortable, clean, well-stocked, and the price was fantastic for being 20 feet from the beach. Plus, the little lounge area overlooking the ocean is great. ***NOTE: BeachFront Only gave clear directions to look at parking signs on the street. We looked once, but because we thought the "No Parking 2-4pm on Mondays" was the rule for every street around there (and it wasn't), we got a ticket. Not BeachFront's problem (they were super clear about it) just something to be aware of if you stay here. Our cottage was perfect! I can't believe how inexpensive it was to spend seven nights on the beach. With the large common area with green grass and patio with great furniture, we felt our living room and dining room was the patio. Our cottage was small and yet everything about it was first class. All new kitchen appliances and everything we needed to cook, clean, and relax. We will definately be back. This was our 3rd visit to Oceanside on the beach and this location was the best! Having the large patio area with a fire pit really puts 835 S Pacific over the top. You are close to everything you need and far enough to have true privacy. It was all about the waves and the space!! The reservation process could not have been more effortless! We arrived to a very tidy and clean, easily accessible room. The room had everything we could need. Our stay was very comfortable and the location was perfect! While the general property was good for a beachfront property. I was told when we booked the only room left (facing a "street") that the street was a very quiet street. That was absolutely not the case. It's the main drag for Oceanside. Not only was the traffic generally heavy, but the constant flow of motorcycles up and down (which resulted in car alarms being triggered) was annoying. What we did enjoy was the common area and the people we met there and the quick access to the beach. If you stay at this facility, I strongly recommend you get a unit as far from the street as possible. I was looking for 2 things: something on the beach and relatively cheap. Beach Front only delivered and exceeded all my expectations. Phenomenal location, great accommodation, and very helpful staff available by phone. I have been getting lots of comments from friends on my facebook pictures and am highly recommending BeachFront Only. My wife and I enjoyed every moment of our getaway at this location. We had our privacy, and the location was the key. We have stayed at other beachfront locations form Coronado Island to Pismo Beach. This was our favorite place. Super value. Responsive Staff. Great Location. Come on over! We had a leaky coffee maker and it was replaced with a new one right away. The street noise was a little more than expected...will return and try to stay in a unit nearer the ocean. Great property locale...lots to do within walking distance. It is cold weather. Would have appreciated having the pilot lit and the wall heater 'on' and already working. Shower head not high enough on the wall..maybe put a vent fan in the bathroom ceiling? Thank you!!! Thanks for your feedback. We can adjust the shower head and we will look into placing a vent in the bathroom. We look forward to seeing you back. my husband and I stayed and really enjoyed the stay. It was perfect price and awesome location. we will be back. It was perfect for what we needed. Our goal was to be beach front and this small apartment was perfect. We enjoyed the neighborhood as if we lived there. Totally preferred this experience over a hotel. We will be back. Great location by the ocean, easy reservation and check in process. Parking around the unit is a bit limited so that is slightly inconvenient. This was my fourth rental with Beachfront Only and was very disappointed this time. Your staff was wonderful as far as booking, very kind and professional. As far as the property, I was very disappointed in it's up keep. First night in we were infested by ants, and when it was reported we were told there is bug spray under the counter. REALLY!! Not the answer I expected. This was a major inconvenience, because we were not able to leave anything on the counter and had to keep all food in our car. The fan in the unit was broken, so unit was extremely hot. The beautiful grass area was almost dead, did not see area watered once during our 7 days. Patio was not hosed once during our 7 days except from me when I finally did it on day 6. A guest who rented a studio had at least 30 people on the patio for a bar b q one evening, so much for watching the sunset that night. Fire pit had marshmallow's on pit as well as ground which the ants loved. Obvolousy the locaton is why I return year after year, but needless to say was very disappointed this time around. I had no problem with the size of the unit since it was just my daughter and myself, but the rest of the stuff was very annoying. Will I rent from you guys again, probably but really feel you needed to know that this time around I was really disappointed in the condition of the property. The ant thing was huge for me, and the cost of now having to eat out most of our meals was an additional expense I had not counted on. Thanks for listening. Thank you for letting us know about your last experience at BeachFront Only. We are looking into your stay to see who may have given you that response. Our usual procedure for ants is to send one of our housekeeping staff down to clean. They will inspect to see if they can locate a point of entry. Our housemen follow and spray the outside perimeter of the building. These critters seem to appear and disappear with the weather. We do not expect you to use the spray in fact we discourage it. So our apologies for our mishap in protocol. We do have a landscaper watching the grounds. It has been an unusually hot season for us, but we will maintain the green grass. Regarding the studio with many guests, we definitely have policies against that. We just need a phone call while you are there to address it. We have staff that live on the premises to handle any noise complaint. Hope we see you again at the beach at BeachFront Only. It was a very sweet vacation. The rental was clean and right on the beach. it was usually hot and humid for september and the rental didnt have a air condition but we call the staff and asked for another fan and within a hour we had it thank you again staff! The rental is close to everything you need and ou can walk to must places. My husband and I stayed here with our 2 dogs. The view was amazing and the location was great, you walked right out to the beach. The courtyard was great for the dogs, but not very doggie proof so if your dogs don't listen u out probably need to keep them on a leash. Also, the fire pit and bbq in the courtyard really came in handy. We barbecued for friends and family and all sat around the fire pit at night. The room was nice and clean and had plenty of room for 2 people, probably too small for anymore, it was even tough with the dogs. There is a convenience store, liquor store and coffee shop within walking distance. We will definitely be staying here again! Interesting historical take on vacations in the mid 40'S. Small,clean, minimalistic. If you are looking for luxury, this not for you, but the price is right if you just want a clean place to lay your head down. Great place to stay. Will come back. Absolutely loved that you didn't have to deal with front desk staff on checking in or out. It makes it feel like it is your own vacation place. We will try to book one of the end units next time. Very affordable. The bungalow was as described but the stay was disappointing. After arriving our tv remote didn't work. Normally it wouldn't matter but with the rain we spent more time inside than normal. They tried to fix it but never did. Also, construction was going on the entire time we were there. We had our dog with us so between the nail gun, saw, hammering, and walking in front of our patio all day, it was very annoying. We asked to move but we're denied. After complaining again via email we were refunded a couple of days, which did show concern on their part. Other than that, being close to the beach was great. Overall the place is nice and I would recommend it if you want to be close to the beach. From my understanding these bungalows won't be there much longer as they are tearing them down to build more expensive housing. I give it A for effort with a C overall. I have stayed in most of the bungalows and this one was NEW, The changes you have made to this unit are Sweet. Perfect, was wonderful. My husband and I travel 300 miles to get to this location.Our little cottage was more than what we expected. Very comfortable, clean and located on a simi private beach. We really enjoyed the property and view. The small kitchen had everything I need to make a meal for just the two of us. It was perfect. The cottage had a small deck that fit our needs and the view during the sunset was amazing. We will be recommend this location to family and friends. We will be back for sure at least once a year with our family and friends. dog enjoyed his stay as well!! Had a great stay, everything we needed was provided. Right on the beach and loved the fire pit at night! Great times. Great location. Loved it.